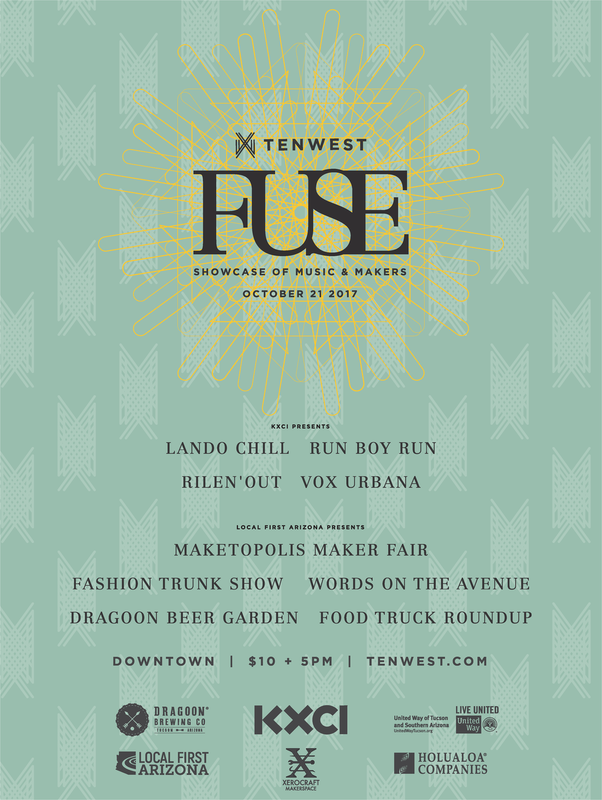 On the Intersection of Pennington St. and Stone Ave.
Local First Arizona’s Southern Arizona team is excited to be a major partner of the TENWEST Festival for the finale event FUSE with a local Maketopolis showcase. In partnership with Xerocraft, Tucson’s local maker-space. What is TENWEST? Festival is a weeklong celebration where arts, entrepreneurship, technology, and communities come together. Through talks, workshops, performances, and networking mixers, the festival allows Tucsonans to build their next Tucson together. What is TENWEST FUSE? After a week of learning, innovation, and networking, TENWEST is holding a showcase of local music and makers to inspire a collective creative energy which will include a Maketopolis event showcasing local makers and artists through the partnership of Local First Arizona and Xerocraft. This event will happen downtown around the area of Stone and Pennington and will feature local bands and a host of unique exhibitors for TENWEST pass holders, Local First Arizona members, and Xerocraft members at no cost. RSVP is required. Performers include: Lando Chill, Run Boy Run, VOX URBANA, Mele Martinez Flamenco, Poetry will be featured from Words on the Avenue. You can also find: The TENWEST Beer Garden with Dragoon Brewing Co., Fashion Trunk Show, Food Truck Round-Up. Doors open at 5:00 PM. All door proceeds will benefit Sustaining Member of Local First ArizonaKXCI Community Radio. Admission is included with TENWEST PASSES, to purchase your pass click here. Local First Arizona TENWEST FUSE Member Exclusive RSVP Deadline is Friday, October 20th at noon.